Soft and delicate is the best way to describe pastel gerberas. 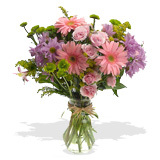 A perfect occasion where pastel gerbera daisies are given is to celebrate a child’s birth. Pastel gerberas express warm wishes. Pastel gerberas also make a lovely friendship bouquet. The flowering heads on gerberas are very similar to those on sunflowers. Gerberas come in a rainbow of colors, and it is the fifth most popular flower after the rose, carnation, chrysanthemum, and tulip. Arranging Pastel Gerberas: The fifth most popular flower in the world, bright colored gerberas are a beautiful way of telling a loved one “you are the sunshine of my life.” We ship each individual gerbera floret with a protective net and a clear tube to support the stem, to ensure that your gerberas arrive and flourish to their maximum beauty and expected vase life. Your bright gerberas may be prone to bent neck, which can be avoided by inserting floral wire in the gerbera stem to lend additional support to the large floret. Otherwise we advise to leave the clear tube as they will only serve to provide additional much needed support to large floretted bright gerbera bouquet you receive. Pastel Gerbera Bouquet Care Tips: Your pastel gerbera bouquet has an estimated vase life of 4-7 days, if properly take care of your gerberas can last longer. On receiving your pastel colored gerbera bouquet, make sure you gently remove the protective cup from each gerber blossom; as the petals will gradually unfold to their full state. Fill your vase with approximately 5 to 6 inches of water depending on its height. Your gerberas have fuzzy stems that decompose quickly in deep water. Gerbera stems are highly susceptible to bacteria blockage which may cause their heads to droop over. Therefore it is very important to use clean water and replenish their supply of flower food every 1-2 days. To make sure gerbera stems remain straight, support the heavy flower heads when conditioning in water.